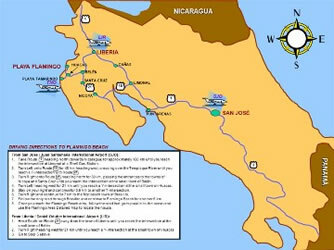 Flamingo Beach is located on the Pacific North Province of Guanacaste. By car, it is approximately 4 hours from the Capital City of San José and its International Airport (SJO), 45 minutes from Liberia’s International Airport (LIR), or 20 minutes away from Tamarindo Airport (TNO) – a domestic airport. 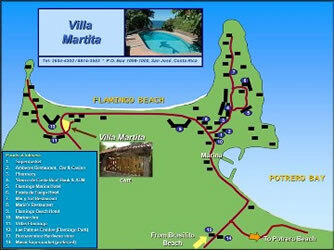 Click on the maps below which show you how to get to Flamingo Beach. Feel free to print them out.